IoT Systems are characterized by increased dynamicity in configuration, system context, system environments and even tasks. Connected systems may change depending on time, configuration and goal. The problem of potential emergent behavior, depending on changes and context, which is not easily recognizable during design time and difficult to analyze is a challenge for such systems. In the past, a system could be thoroughly analyzed and tested and potential interactions and goals could be considered during the design process. Updates of system parts were completely under the control of the system operator and usually heavily tested, not done immediately in the live system over the air. With IoT systems, we need to consider uncertainties and work with the unknown. We can no longer rely on covering all risks during design time, we need to continue risk management during the complete system lifecycle. 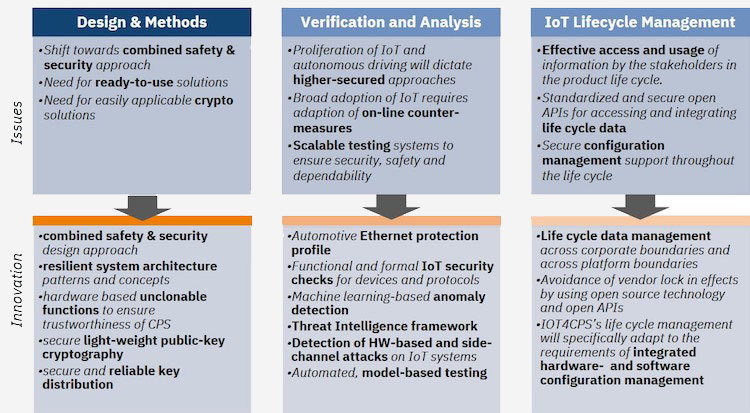 With the application of IoT in critical environments (production, driving) the safety, security, reliability and resilience of IoT-based CPS systems becomes increasingly important. To ensure these qualities in largely heterogeneous, distributed and dynamic environments, a clear understanding of the properties and how they are ensured during the complete system lifecycle is necessary.